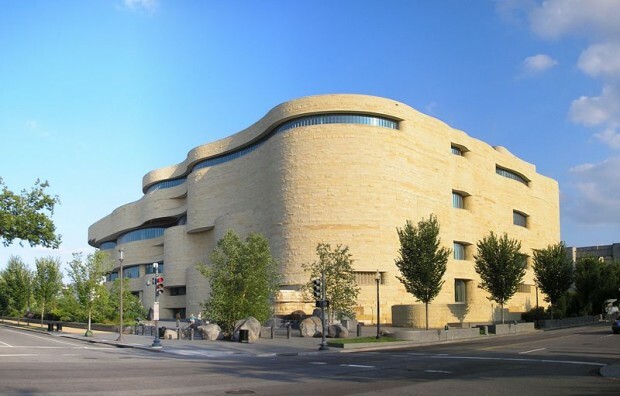 The National Museum of the American Indian | Top Places to See in Washington, D.C. The National Museum of the American Indian is one of the largest and most diverse collections of its kind anywhere in the world. The museum is dedicated to instructing people about the life, culture, arts, and history of the Native American. The building itself is constructed with a golden limestone exterior, and curved edges, with the intent of making it resemble a natural rock formation, such as would be found in many areas where American Indians lived in the past. In addition, the different sides of the building are surrounded by man-made hardwood forests, wetlands, and meadows. Between the DC Museum, and the George Gustav Heye Center in New York, there are more than 800,000 artifact items, brought together from over 1,200 different tribes and cultures. The museum also features a photographic archive holding roughly 324,000 pictures, ranging in time from the 1860s onward. The museum has free admission, and is open to the public from 10 am – 5:30 pm every day of the year, save for December 25th. For directions and parking information, click here.